Santorini island is arguably one of the most romantic destinations in Greece, boasting many luxurious accommodations. 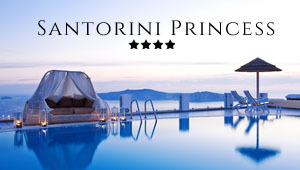 Santorini hotels are among the most luxurious in the Cyclades. Numerous spa resorts, suites, and villas are found right on the edge of the caldera in the villages of Oia, Imerovigli, and Fira, with private terraces and pools offering a breathtaking view to the sea and the submerged volcano of Santorini. Oia and Imerovigli are picturesque villages with calm, romantic atmosphere and upscale Santorini hotels. Fira is the capital of the island. Its paved streets are bustling with numerous shops, restaurants, and bars. The volcanic beaches of Kamari and Perissa also offer nice hotels in Santorini for visitors who want to be closer to the beach. Big seaside resorts and contemporary villas can be found right on the unique black sand, while the nearby settlements offer family hotels and cozy room rentals. Our lists of accommodation types have been carefully chosen to cover the needs and preferences of modern tourists in Santorini island. Have a look at the Santorini hotels that we suggest and feel free to contact directly any accommodation through their booking form to ask a question or make a reservation. Many hotels in Santorini island, in Greece also have online booking engines to make your reservation quickly and easily. You can have access to many reviews. As we take no commission from any bookings made via our website, prices are cheaper. Before making your reservation, check for available offers and last minute deals. Surely the most impressive side of Santorini is the caldera. Most famous and luxury hotels in Santorini are located on the top of these hills offering an amazing view over the sea and the submerged volcano. The wonderful white villages that line up the edge of the caldera offer many options. Oia is certainly the most picturesque village of Santorini and an ideal place for honeymooners. Imerovigli is also very romantic and calm, with a great view of the volcano and the sea. Fira, the capital of Santorini, is the busiest spot of the island and nice to stay if you want to be in the center of activities. For visitors with families and people who want to be close to the beach, we suggest accommodation in Kamari or Perissa, the two main beaches of Santorini island. A Santorini hotel may vary in range and facilities, from super luxurious resorts to budget places. Tamarix del Mar Suites are located in Kamari, eastern Santorini. The accommodation boasts air conditioned units that include hydro-massage bath tub, veranda, fridge, kettle, satellite TV, phone, wifi and safe. The complex features two swimming pools, Jacuzzi, children's pool and playground, sauna, fitness center, small library and more. The helpful staff will facilitate guests with their needs and requests. Transportation from/ to the airport/ port, car rental service, secretarial services, excursion booking, general information and beauty treatment arrangements are only some of them. El Greco Palace in Santorini was constructed in 2013 with one and only intention: to provide the best holiday experience possible. Located in the island’s capital town Fira, promises a restful and rejuvenating stay with various facilities and services. Guests will feel completely refreshed and relaxed in the white-colored, elegant and lavish rooms and suites. All the essential comforts, such as Wi-Fi access, air- conditioning and a balcony or terrace with a view of the pool or the garden, are provided. A swimming pool, a gym, as well as massage and beauty treatments are also available. Feel the magic of Santorini in the premises of Katikies Hotel, situated in the uniquely beautiful Oia settlement. Katikies Hotel offers luxurious, up-to-date accommodation ideally combined with tradition and romance. All units include necessary amenities, as well as private bathrooms and private sea view terraces. A mini wine cellar is an added bonus to the hotel’s spotless accommodation. Katikies Hotel also features the fascinating facilities of infinity pools, Jacuzzis and a library. Santorini Princess Hotel is situated in Imerovigli, Santorini, offering breathtaking views of the volcano, the caldera and the Aegean Sea. The hotel boasts air conditioned units that include private balcony, living room, mini bar, satellite TV, phone, laptop with wifi access and safe. The accommodation features pool, spa, pool bar, restaurants, sitting areas and other facilities as well. Organization of wedding receptions can be arranged. At the reception, the helpful staff will facilitate guests concerning transportation, car rental services, room service, laundry/ ironing service and more. Pegasus Suites and Spa is located in Imerovigli, Santorini, only 100m from a shopping area. At this complex, guests may select between various suites and studios featuring many facilities like terrace with amazing view, cotton-satin bed linens, air-conditioning and mini bar. Also, the suites have satellite TV, dial phone, free internet access and more. Other facilities and services include an outdoor swimming pool with Jacuzzi, spa with an indoor heated pool with Jacuzzi and sauna, pool bar, bell boy service, wifi, fax, car rental service, arrangements for tours and transportation and others. Aressana Spa Hotel and Suites in Santorini promises the most peaceful and quiet stay with the greatest luxury and beauty possible. Located in the vibrant cosmopolitan town of Fira, it is made with style, elegance and sophistication featuring some characteristics of the Cycladic architecture and some materials from Santorini’s volcano. All the rooms and suites of this five-star hotel are distinctly modern and tasteful but also warm and cosy. They all have a private balcony or patio. Also, a swimming pool, a fitness center and a spa center are available for all guests. The unique sunset of Santorini, the fascinating caldera, the deep blue Aegean Sea, the serenity and beauty of nature are all granted to you in Grace hotel. Grace Hotel in Santorini that lies on the top of the Caldera Cliffside in the lovely Imerovigli provides a variety of luxury rooms and suites. All units are equipped with the most modern amenities and feature private terraces with splendid sea view. Huge swimming pools, spa facilities and entertainment activities, like water sports and movie nights, are just a small sample of what Grace in Santorini has to offer. Rocabella luxury hotel in Santorini takes you on a magical journey of relaxation and delight. Its elegant, spacious studios, suites and villas are all very comfortable, as they are designed specifically to give pleasure and are equipped with modern amenities. Rocabella hotel treats its guests like royalty, offering special services and facilities. A small sample of Rocabella features includes four swimming pools, restaurant and bars, wellness centre&spa, and also a boutique shop. Enjoy your holidays in the peaceful, stylish and modern Astra Luxury Suites hotel in Santorini, located in the lovely Imerovigli village. Featuring balconies with unobstructed views to the endless sea and the impressive Caldera and private pools or Jacuzzi, Astra Suites provide one of the most comfortable and romantic accommodation in Santorini. Guests are welcome to relax while on a spa treatment or a massage session, and are invited to travel around the islands with Astra Suites hotel private cruises. Dana Villas luxury accommodation is located just 800 metres from the centre of Fira in Santorini, right above the gorgeous Aegean Sea and the caldera. The studios that form the complex feature all modern amenities and provide a comfortable stay. In Dana Villas guests are welcome to enjoy swimming at the pool, taste Greek cuisine at the restaurant, relax in the Jacuzzi, watch the magnificent sunset from the privacy of your balcony and at the end of the day sleep in the comfy double or king size bed. Aria Suites in Santorini can be found in a place of unsurpassed beauty in Fira Town, offering views of the unique sunset and the remarkable caldera and volcano landscape. With a minimal and sophisticated aesthetic style, it is built according to the typical Cycladic architecture. It provides 6 different types of elegant and luxurious suites with all the necessary comforts and amenities, like a bathtub Jacuzzi, queen-size beds, a private balcony, a personal laptop, and free Wi-Fi internet access. Facilities and services offered include a swimming pool, beauty therapies and massage treatments. Adamant Suites in Santorini are very close to the vibrant center of the island, Fira town, yet at the same time they are very peaceful. Hidden in a sheer stony hillside, this stylish and sophisticated resort offers the most romantic and comfortable stay. It is a five-star complex that provides six different luxurious suites, all of which are designed and decorated according to a distinct precious stone. Featuring private Jacuzzis and private terraces that overlook the infinite blue of the sea and the amazing view of the volcano, Adamant Suites can promise the ideal getaway. Archontiko Apartments in Santorini is a lovely complex of self-catering, large 2-storey apartments, set in a beautiful location outside the lovely village of Fira. With easy access to most shops, restaurants and cafés, as well as nice beaches, the hotel is a perfect choice for relaxed holidays, as it provides comfort and convenience. The rooms are equipped with all essentials, such as A/C, wi-fi, TV, heating, hairdryer and kitchenette with cookware. The highlight of the hotel is its sun terrace with superb views to the impressive Caldera and the Aegean Sea.